Each #10 Can contains 2 pounds of Dehydrated Banana Chips. 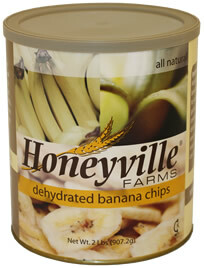 Honeyville's Dehydrated Low-Moisture Banana Chips are produced in a process where moisture is removed from the product using a vacuum. This remarkable process concentrates the fresh product taste, natural color, and texture of fresh product in it's dehydrated state. The taste is great, and the nutritional food value is excellent. Dehydrating provides natural fruits and vegetables to be stored effectively for long periods of time. Remember Honeyville's Freeze Dried and Dehydrated fruits are stable products with a long shelf life. Honeyville's Dehydrated Bananas contain banana, coconut oil, sugar, and natural flavoring for a flavor that is unbelievable. Great as a snack. Each # 10 Can of Dehydrated Banana Chips contains 2 pounds of product. 2 pounds of Banana Chips measures out to about 40 1/4 cup servings of dried bananas. A #10 can measures 7 inches tall and is a little over 6 inches in diameter, or roughly the size of a large coffee can. Shelf Life: Dehydrated Banana Chips may be stored in the sealed #10 can (with included oxygen absorber packet) for 10 to 15 years under ideal storage conditions (a cool, dry place). Editor's notes: These Dehydrated Bananas are truly addictive. This is another product that I keep at my desk to snack on. Unfortunately, they don't last very long because I can't stop eating them. The dehydrated bananas have been processed with a small amount of coconut oil and sugar that really brings out the banana flavor. They are nice and crisp and are a nice alternative to potato chips. I like to take a can camping and hiking as they make an excellent energy snack. They're great in a mixed bag with the Freeze Dried Strawberries, and Freeze Dried Blueberries.